TU Go was a ground-breaking multi-platform communications service that let you log in to your phone number and use it over Wi-Fi years before mobile platforms introduced native Wi-Fi calling. It kept users connected in poor signal areas, bypassed roaming charges when abroad and supported use of devices without SIMs to call and text, all using your existing Telefonica phone number. TU Go was available in the UK from 2013, went live in Argentina, Peru, Brazil, Colombia and had well over 1M registered users on iOS, Android, Windows Phone 8, Windows PC and Web. When I joined the project team as UX Lead, the TU Go apps presented an event-based timeline to users, with tabs for each communication type - calls, messages and voicemails. This was a system-focused, impersonal and dated way to display what is very personal content. No threading meant users saw no continuity in conversations, and splitting out communication by type increased navigation load. In addition, the Android app had been ported from the iOS app and as a result, Android users hated it. A client optimised for Android was desperately needed. 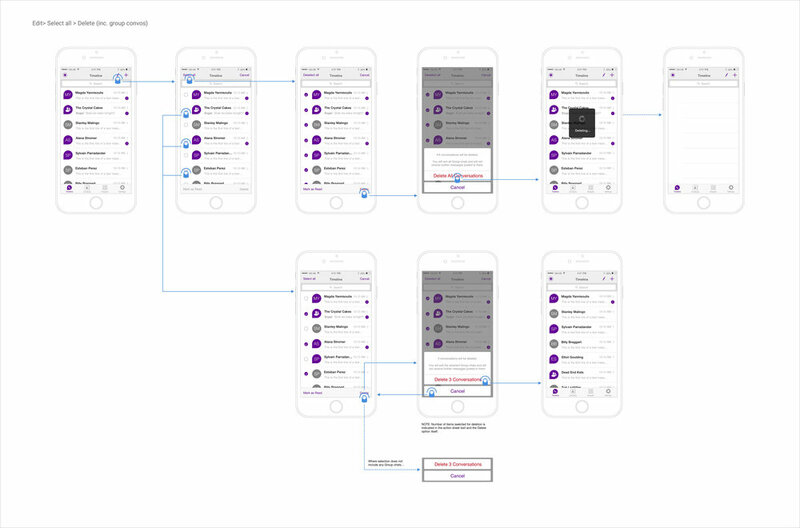 I led the redesign of the mobile apps for the service to introduce threaded conversations, integrating all communication types into a single thread per number and ensuring the designs were tailored to iOS and Android. To this end, and to maximise ease and speed of development, it was important to stick to using standard interaction elements offered by Android and iOS. The first task was to redesign the app architecture, simplifying the interaction model and reducing navigation overhead for users. This new architecture applied to iOS and Android for phone and tablet as it used interaction elements that both platforms provided. Once I’d got the new architecture agreed with the Product and Development teams, I began designing key screens and flows for the Android and iOS apps within the new architecture, supervising a Junior UX designer covering design for Windows Phone and Windows desktop apps. Designs for mobile platforms covered phone and tablet. Frequent user testing across platforms was part of the natural rhythm of the project. We were lucky to have an Android developer in the London office and he created native Android prototypes at various points to support our user testing. This meant we could resolve issues uncovered in testing very quickly - the Android dev would alter the prototype to incorporate fixes which we could then validate with subsequent users within the same test cycle. The prototypes were passed to the main Development Team in Madrid to support building the Android app. The prototype code was throwaway, but it was very useful for the remote developers to have an interactive introduction to the new design. The low tech test setup was interesting - I used an epidiascope I found in the office and the wall-mounted TVs in the office meeting rooms to hack picture-in-picture video, capturing phone interaction and users’ faces with a single camera. Switching to this style of spec meant documentation was quicker to produce, easier to maintain, easier to consume by developers and the fidelity of the delivered product to the design increased. I worked closely with UI designers to develop a coherent cross-platform visual identity for the service and later, a framework to accommodate rebranding of the apps for Telefonica sub-brands in different markets - O2 in the UK and Movistar and Vivo in Latin America - with their different identities and colour schemes. With the new apps we grew the numbers of service users to 1M+ per month running 44M sessions. We launched in several more countries in Latin America, keeping people connected and saving them money. The iOS and Android clients averaged 4 stars on the App Store and Google Play. With more platforms and more web portals offering access to the service I explored the path to registering for TU Go service, highlighting opportunities to improve the service user experience. This was useful in my later redesign of the onboarding flow for each app, incorporating insight from user research from Latin America, data from user interaction with existing onboarding flows and benefiting from new developments in iOS and Android helping us make onboarding more seamless. User research made clear that users tended to use the service in a single context only and seemed unaware of the other aspects of the proposition. Data from existing onboarding flows showed that nearly all users skipped the intro animation explaining the proposition. New designs explored a quiz-based introduction and animation, but these only made it as far as user testing. TU Go service was discontinued at the end of 2017, as mobile OS providers caught up with TU Go and offered native Wi-Fi calling.